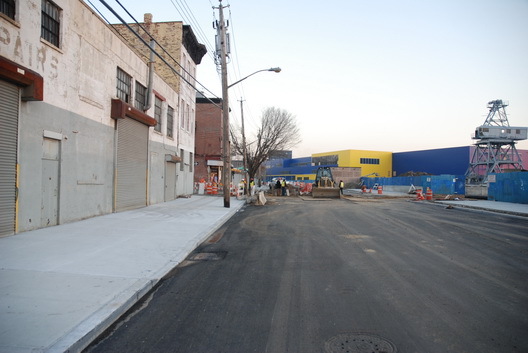 The devpavingstoneification of Beard Street in Red Hook to make the drive smoother for the up to 50,000 a cars a week that will be coming to the neighborhood once Ikea opens next year, looks like its on schedule. Here's a redone segment of the street, with new sidewalk and blacktop. Other cobblestone streets in the neighborhood will, presumably, survive. Am I missing something? Shouldn't the city be jumping all over IKEA for stealing those pavers? Am I missing something? Has the city acted against IKEA for stealing those Belgian blocks?